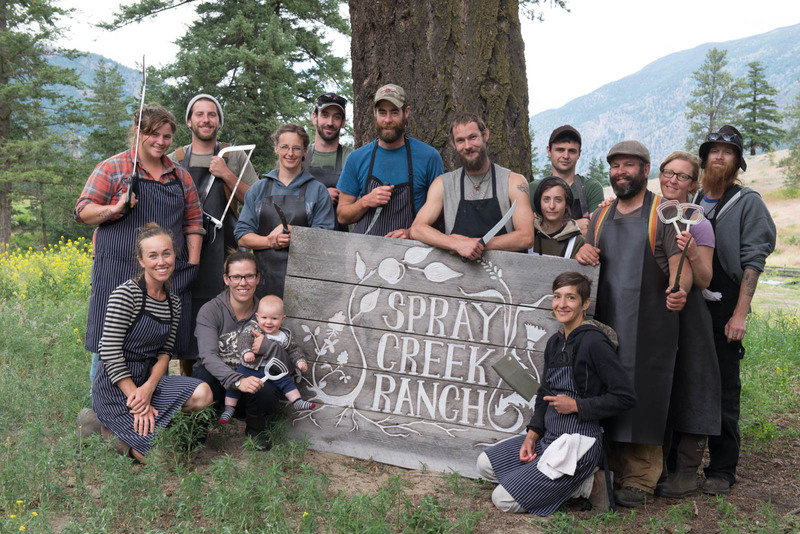 Tristan and Aubyn Banwell, managers of Spray Creek Ranch, have shared quite the journey. 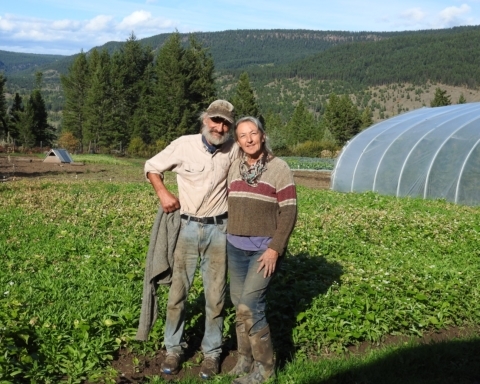 They met in high school band class in Northern California, spent their university years as urban vegans and then homesteaded off-grid for five years before moving to the juxtaposed landscape of Northern St’at’imc Territory near Lillooet. 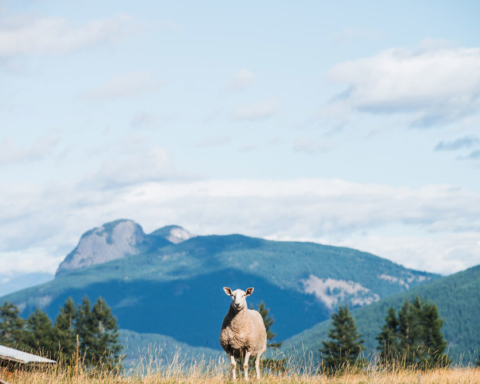 Situated between rugged cliffs, endless forested mountains and the mighty Fraser River, Spray Creek Ranch is also home to cattle, pigs, and poultry, as well as an on-farm abattoir and meat shop. Of 260 acres, around 125 are under gravity-fed irrigation, including open perennial pastures, orchards, silvopasture, and homestead gardens. The remaining land includes mostly native forest and protected riparian areas. For thousands of years, the land where Spray Creek Ranch is situated was a gathering place for St’at’imc people. The old homestead cabin and original irrigation ditches date back to the late 1800s and the land was deeded in 1897. More recently, the farm was a commodity cow-calf ranch, producing winter feed like hay or corn silage while the cattle spent the summer on range in the mountains. Calves were sold at auction in the fall and the cycle started again. 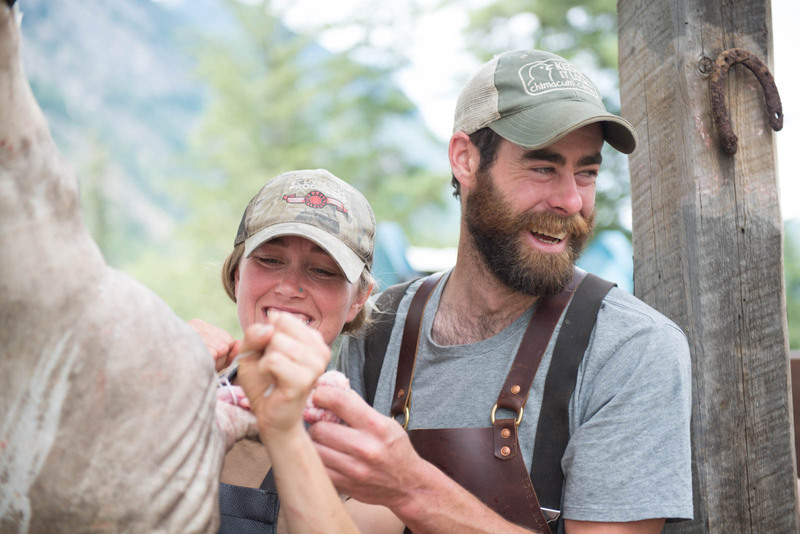 In 2014, Tristan and Aubyn moved onto the land and began the process of reshaping the ranch from a conventional, small-scale commodity model to an organic and regenerative agroecosystem. Conventional, continuous grazing is like driving a tractor without brakes or a steering wheel. We are now able to use our cow herd as a tool to improve the soil environment, which is the foundation of plant and animal health. 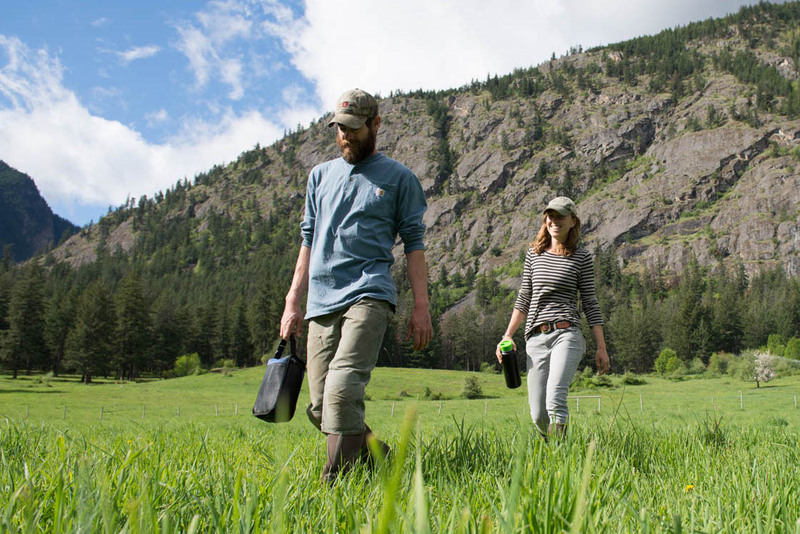 Soon after arriving on the farm in 2014, Tristan and Aubyn started Management-Intensive Rotational Grazing (MiG) à la Jim Gerrish and Allan Savory. This involves keeping the cows on the move anywhere from once every three days to a few times per day, depending on the season, pasture condition and their goals. “Cattle are the primary tool for regeneration on the farm and they work hard every day turning grass and mountain water into fertility,” says Aubyn. Next come the poultry flocks—also major contributors to soil health—turning farm-milled organic feed into powerful fertilizer. They break up the cow manure and grass thatch that accumulates in the pastures, allowing new plants to germinate and thrive. Pigs act as a disturbance agent on the farm, breaking up the ground in preparation for reseeding more diverse pastures. MiG is labour-intensive, but Tristan says that the benefits far outweigh the additional effort. “Conventional, continuous grazing is like driving a tractor without brakes or a steering wheel. We are now able to use our cow herd as a tool to improve the soil environment, which is the foundation of plant and animal health.” Using portable electric fencing, the cows are moved to fresh pasture, usually each day, along with their portable water and mineral feeder. Moving the cows across the ranch this way spreads their impact and fertility evenly over the pastures, encouraging healthy plant growth and carbon sequestration while disallowing the over-grazing, nutrient pollution and compaction that comes from conventional continuous cattle grazing systems. The level of attention to, and care for, their cattle does not stop here. 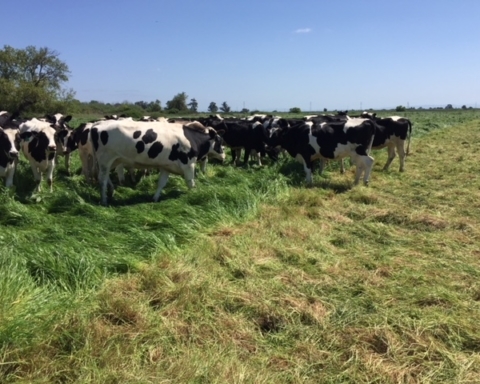 In late summer, grazing is carefully planned so that as much standing forage can be stockpiled on the farm as possible. This is then rationed out over the winter to extend the grazing season well into the new year. “Every day we’re grazing, the cows are working for us, and we’re saving hundreds of dollars,” says Tristan. 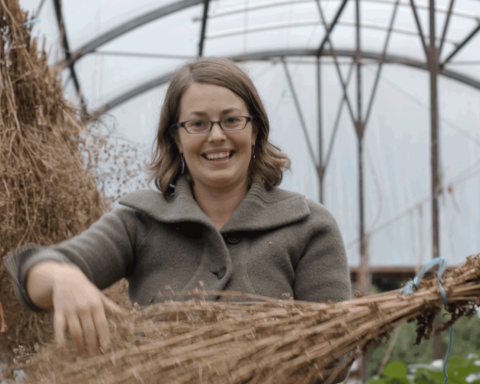 What little hay is needed is purchased from local certified organic farms. Because the cows have a chance to recover their body condition on spring grass before calving, calves are able to winter with their mothers, postponing the stress of weaning until the calves are older. When calves are weaned, it is done so using a multi-stage process to keep weaning stress on both cows and calves to a minimum. During the fall of 2015, baseline soil carbon monitoring was completed across all fields on Spray Creek Ranch. 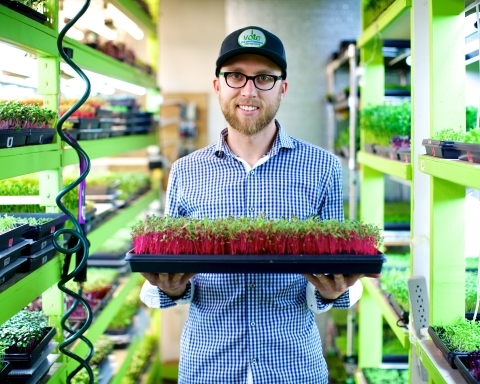 This was conducted in partnership with a Thompson Rivers University Master of Science student, Dan Denesiuk, who was part of Dr. Lauchlin Fraser’s interdisciplinary plant ecology and land management lab in Kamloops. Meaningful research conclusions will not be available for some years, but there are compelling qualitative observations that the land is celebrating the shift to regenerative agriculture. In terms of increasing biodiversity, there has been an increase in the variety and abundance of clovers without seeding. The clovers initially came back from the pasture seed bank during the long rest periods between grazing, and are able to set seed again each season. Another key observation is that their 80% alfalfa hay fields filled in with grasses in only two years. Leaving tall residual after grazing appears to favour grasses, as they can recover more quickly than the alfalfa, which has less leaf area at the bottom of the plant. They have also decreased the amount of irrigation water applied to the land as organic matter builds and trampled forage reduces soil temperature and evaporation. When analyzing the financial picture, it was evident that a right-sized commodity cow-calf operation would not provide a livelihood. At the same time, they knew that the land could provide much more with additional labour. Much deliberation was focused on the mix of enterprises that would work on the land and in the local markets. Thus began a period of adding and trialing elements, then eliminating the ones that were not a good fit. They also began development of an on-farm abattoir and meat shop, starting with obtaining a Class D slaughter licence. 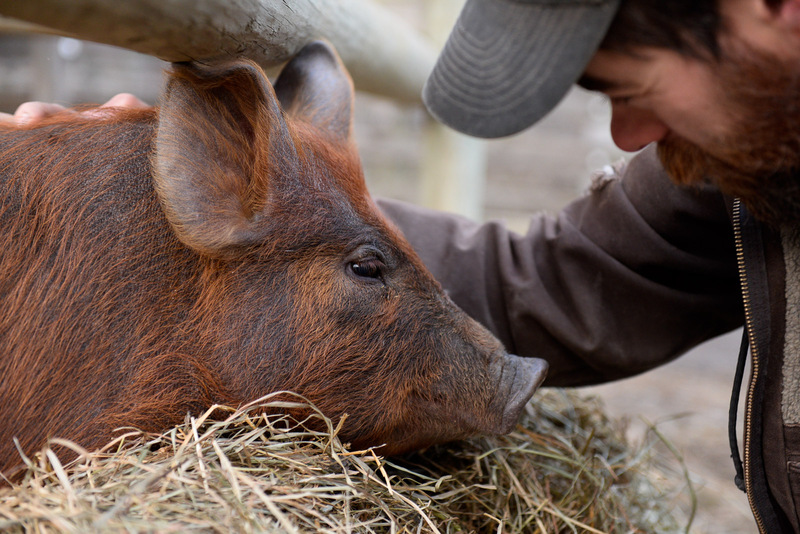 This allows on-farm slaughter of many of their animals, and their eventual goal is to slaughter, butcher, and package all their production right on the farm for direct marketing. The abattoir and meat shop is also developing into an independent enterprise that will help other local, small-scale producers get their products to market. 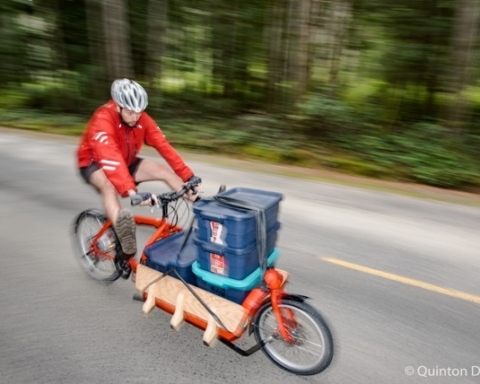 Beyond the reach of their business, the Banwells have found other ways to contribute to the well-being of the community. 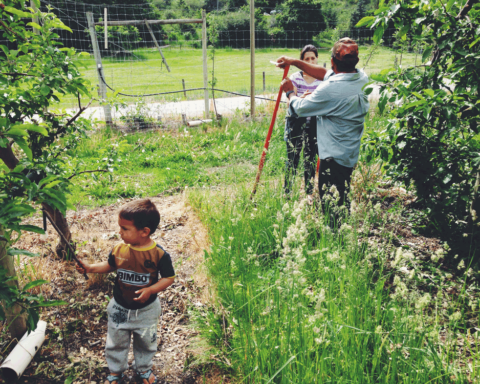 Soon after moving to Lillooet, they began working to reduce barriers for small-scale farmers in the area. 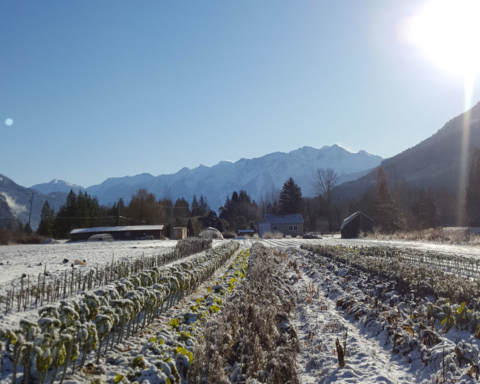 In 2015, they trialled a cooperative marketing effort for Lillooet-area farms, which led to the creation of the Lillooet Agriculture & Food Society (LAFS). 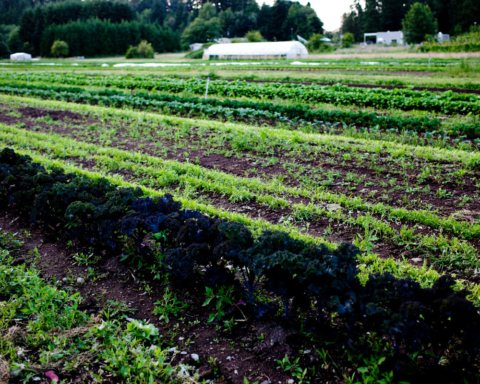 This non-profit supports local farmers, ranchers, growers and other passionate individuals who are building a sustainable food system. 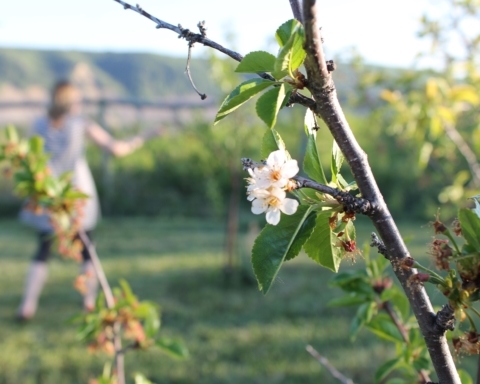 Bringing workshops to town, launching the Lillooet Grown brand, and tirelessly working to improve market access and local production and processing capacity has kept the dedicated board, staff, and contractors busy. 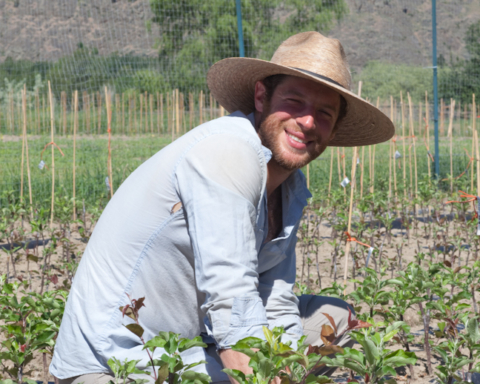 In addition to chairing LAFS, Tristan will be representing the North Okanagan Organic Association on the COABC Board starting in February. 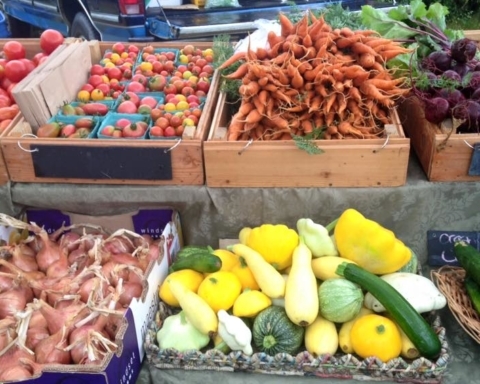 Aubyn sits on the board of the Lillooet Farmers’ Market Association, and is working to bring the Farmers’ Market Nutrition Coupon Program to the community. The couple has been very involved with Young Agrarians (YA), taking advantage of mentorship and learning opportunities as well as sharing their knowledge at YA events. They also donate their products and time to support local fundraisers and initiatives like the Lillooet Friendship Centre Food Bank, the Lillooet District Hospital Foundation, the Náskan Ūxwal (I’m Going Home) Walk, Love Lillooet, the T’it’q’et Amlec Food Security Initiative and Lillooet Seedy Saturday. 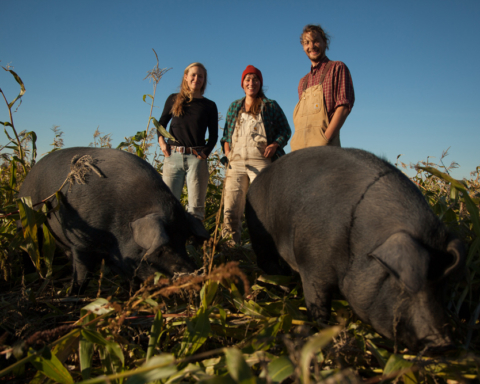 Tristan and Aubyn have already had a remarkable impact in terms of strengthening the health and vitality of their soil, pasture, livestock, community, and livelihood through transitioning the land and their lives toward organic regenerative practices. The significance of protecting land and water for future generations is even more meaningful with their first child due in early February.